In partnership with Zagster and Beaumont Health, the City of Dearborn has launched the Dearborn Bike Share Program. As of June 13, 50 bikes are available for use at 10 stations throughout Downtown Dearborn, and can be accessed via a $20 annual membership or a non-member hourly rate. Members receive 2 hours of free bikeshare service per ride, and pay $2 per hour for each subsequent hour of use (up to $20). 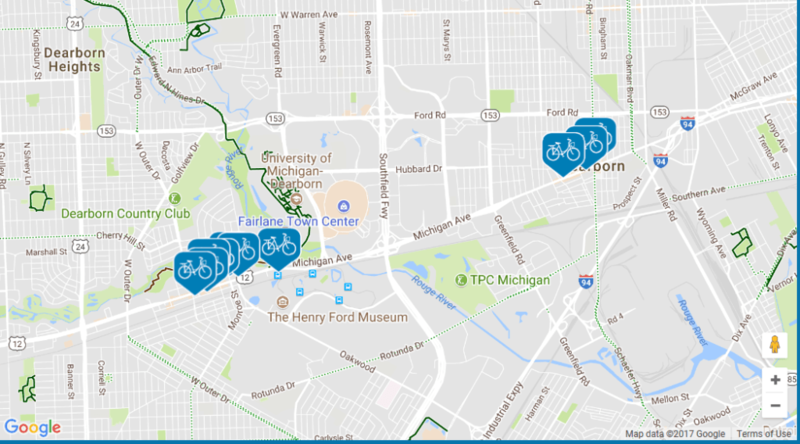 The Dearborn Bike Share Program aims to diversify mobility options for locals, and is part of the Healthy Dearborn initiative, a program supported by the Kosch Family and Beaumont Health in partnership with the City, that promotes healthy living. For more information see the Dearborn Bikeshare site link, below.